It is not unusual for the Guide to feature the occasional grisly story, with executions, crime and one to two gruesome deaths cropping up now and again. I am, however, not entirely without a heart and it is my pleasure to feature a nautical, romantic keepsake today in the colourful form of this sailor's valentine. This valentine was auctioned in New York eight years ago for over $13000. It dates from the early nineteenth century. Quite unlike the rather more mundane paper valentine cards so popular today, this is a double mahogany frame in which dozens of shells have been carefully arranged to send a message of love to a lucky recipient. 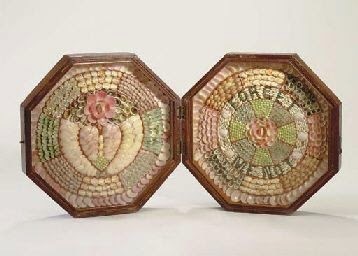 On the left, the shells form the shape of a heart topped with a rose, a pair of symbols that can hardly be misinterpreted as anything but adoring. However, should there be any room for confusion the artist has decided to be absolutely clear in the message they wish to send and really highlights the point in the opposite frame. Here on the right, the message Forget Me Not has been carefully picked out in colourful seashells with another heart to seal the deal, leaving this is a most romantic token to be gazed at and cherished whenever the lovers concerned are parted. This is an utterly beguiling little artefact that marks a moment in history. Though we cannot know the story of this shell-studded valentine, I do hope it ended more happily than some of the tales I tell here at the Guide! How delightful! Seamen were often tremendously skilled craftsmen, because between periods of intense activity like sail handling, unless there was bad weather, there was often very little to do, and unlike soldiers they could not just wander off or go hunting. And there's only so much mending to do. It's a thing of absolute beauty, isn't it? How I would love to know the story behind this--but perhaps it's better not, because then each of us can imagine our own. Such a pretty object! Like you, I hope the recipient never forgot! I hope for a happy ending!